Leading organizations in banking, insurance, retail and many other industries worldwide now use the Kofax SignDoc® electronic signature family of products to reduce their operational costs, speed time to closure, improve customer satisfaction, stay compliant and operate securely. Moving away from wet-ink signature processes to electronic signatures helps organizations achieve these performance goals, and has become an integral part of Digital Transformation initiatives. With Kofax SignDoc, your customers, employees and business partners all reap the benefits of trustworthy, secure and convenient paperless signing every day whether signing in-person or online. Kofax SignDoc can be integrated into various business processes and environments throughout your organization, including signing orchestration workflow, web-based middleware, desktop client, plug-in or SDK. SignDoc is available as a standalone solution or as part of the broader Kofax TotalAgility® platform, which may be deployed on-premise or in the cloud. Convenient and trustworthy e-signing is an essential building block of your digital transformation strategy. Kofax SignDoc is enabling convenient, secure and legally valid electronic signing of digital transactions. SignDoc supports compliant e-signing to laws, acts and regulations and technical guidelines governing the use of e-signatures around the world. Kofax SignDoc delivers substantial evidence of approval and adoption of a document’s contents and its binding, conclusive, non-reputable character. It enables the validation of authenticity and integrity of signed documents - by providing means to authenticate a signer's identity as well verifying that the document has not been altered after signing. What are Electronic Signatures good for? Electronic signatures provide a central building block to enable and establish trust and confidence in digital transactions. Trust in digital transactions is quintessential for digital transformation. E-signatures are also crucial to achieving complete end-to-end digital processes because they eliminate that final, paper-based step. A signature establishes validity of a document to allow the reader to act on it as a statement of the signer’s intent, and leaves evidence to that effect afterwards. Signatures represent a physical manifestation of consent. Decrease paper usage in your signing processes. 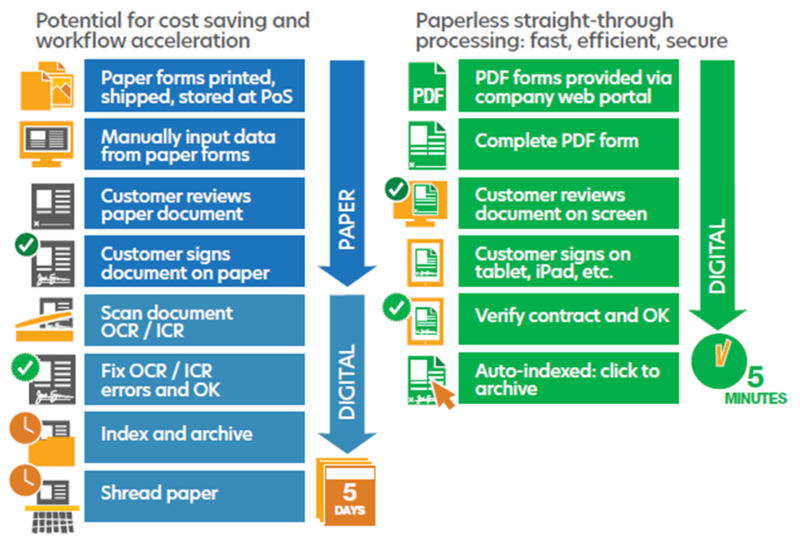 Go digital end-to-end, and completely paperless by replacing wet-ink signing and print-ship-scan procedures with digital signatures. Cut time needed to complete contracts or approvals from days to minutes. Complete electronic processes provide faster turnaround times of contracts and improves the time to revenue by eliminating waiting times. Transform your customer experience using the communications channel of their choice - enable them to sign on any device, anytime, anywhere. Improve compliance to legal requirements such as US ESIGN Act and EU eIDAS Regulation and help avoid litigation by providing a traceable, end-to-end audit trail of all process steps and transactions. Mitigate risk of external or internal fraud attempts by adding additional layers of trust, leveraging multi-factor authentication, digital certificates and signature biometrics. A key advantage of e-signatures is detecting whether a document has been changed post-signing and viewing the process audit trail, which includes information, such as, who signed the document and from which IP address. Users can even view the document itself at various points of the signing process. Kofax SignDoc provides all the real-time insights and tracks the status of the documents. Understand if documents have been submitted for signing, who has signed and who is missing. Electronic stored documents can‘t get lost and provide complete audit trail. Kofax SignDoc signs documents tamper-proof inside a document (and not only the envelopes like other solutions). Convenient, Comprehensive Signing Options. SignDoc not only triggers the e-signing process via click-to-sign, but also uses handwritten signatures, which are often the preferred choice in face-to-face signing scenarios in many countries. Improved Compliance and Lower Risks. SignDoc provides clear proof of who signed (signatory), what they signed (content status of a document at time of signing), and when they signed (date and time). Strong Evidential Weight. SignDoc goes beyond electronic signing of a document package by providing digital signatures for each, single signature included in a package. Same-Software Auditability. Unlike other solutions, Kofax SignDoc verifies transactional integrity with easy access to both document and process audit trails, without the cost and headache of maintaining additional software. Quick Deployment. Create, send, track, and sign documents and forms digitally for quick deployment. Or, embed signed documents and forms deeply into your own applications or workflows (via web-based middleware or SDK) to create more tailored experiences. Full branding. Complete white-labeling of your e-signing solution is possible with SignDoc. Easy Integration. SignDoc integrates into existing core systems and collaboration with corresponding workflows, as well as in-depth reporting and monitoring of transactions. Multiple System Platform Support. Including desktop and mobile OS - Windows, iOS, Android and Linux. Multiple Deployment Options. Including on premise (behind an organization’s firewall), in the cloud and in hybrid mode. Kofax SignDoc is an Integral Part of Digital Transformation. Electronic signatures are crucial to achieving complete end-to-end digital processes and digital transformation, because they eliminate that final, paper-based step. Customers are delighted with the option to sign anywhere, anytime and consider this option to be a significant improvement in their engagement with an organization. Organizations benefit from using end-to-end digital business processes that save them time and money, increase process security, and free their employees from having to perform time-consuming paper-based processes, allowing them to spend more time focusing on customer service. Banking. Authorize account openings; Originate consumer loans or mortgages; Manage wealth and assets. Insurance. Apply for life insurance, as well as health, accident and other forms of insurance. Telecommunications. Sign contracts for mobile, cable, and broadband services; Transfer phone numbers. Retail. Authorize payments; Return merchandise. Health Care. Document a patient’s consent to treatment; Authorize physician credentials; Sign healthcare provider agreements. Power, Oil & Gas. Contracts with energy suppliers. Manufacturing. Bills of lading or waste treatment. Integrate Kofax SignDoc easily, right out of the box, into the broader Kofax TotalAgility platform. Bundle Kofax SignDoc into a solution framework built on a platform such as Kofax Onboarding AgilityTM. Combine Kofax SignDoc with individual platform components such as the Kofax Customer Communications ManagerTM document composition solution. In addition to leveraging Kofax SignDoc as a standalone solution, you can also deploy it as part of the broader Kofax TotalAgility® platform. This unique platform creates end-to-end digital interactions with customers across a wide range of industries and use cases. Conventional, isolated solutions fail to facilitate synergies. SignDoc seamlessly integrates with mobile ID, as well as document composition, capture, and preservation, workflow processing and management. Contact us for more information regarding Kofax SignDoc.